Researching is sometimes incredibly boring. I know as a History major I probably should not say that, but I am sure many of you would agree that it often feels monotonous, tedious, and tiresome. It certainly feels that way when you have been researching something for quite some time and even though you have a few leads, nothing seems to check it entirely. There are also those rare moments in which something does reveal itself and even if no one else can recognize the importance of the moment, you yourself feel that you are the ultimate puzzle master, fitting the pieces together slowly but surely. While working on some final research for some of the more illusive churches within my districts, I discovered an entirely new way to research. Well, I would say that it is not new to everyone, but certainly to myself. I started by working backwards, looking at the website of the newest congregation that occupies the church I had been searching for. When that turned up very little I visited the Missouri Valley Room, and again, no such luck. I was momentarily excited because their seemed to be a wealth of information on the church I was looking into, Paseo Christian Church, though the MVSP only had information on the West Paseo Christian Church. Anyways, I finally took the problem to my internship advisor at City Hall and we both attempted to unravel the secrets surrounding the church such as architecture and the original congregation. Unfortunately, we had little success.Eventually, after a LOT of googling I learned a very brief history of the church. That said, it certainly was not enough to write a full paragraph about. While I did have the architectural information and a little information on the first congregation, I still wanted a more complete history of the church’s function in the city today. Since starting this internship, Google Earth has been one of my best friends. 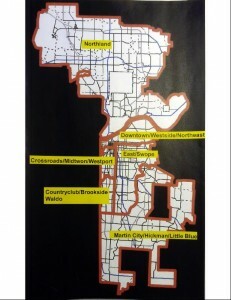 I use it to maneuver around the buildings and try to understand the architectural influences of a structure, etc. Well after circling around the building at least a dozen times, I noticed an engraving on a stone tablet above the back (probably basement) entrance to the church. (the image is not fantastic, but I think it captures the awesomeness that is Google Earth). 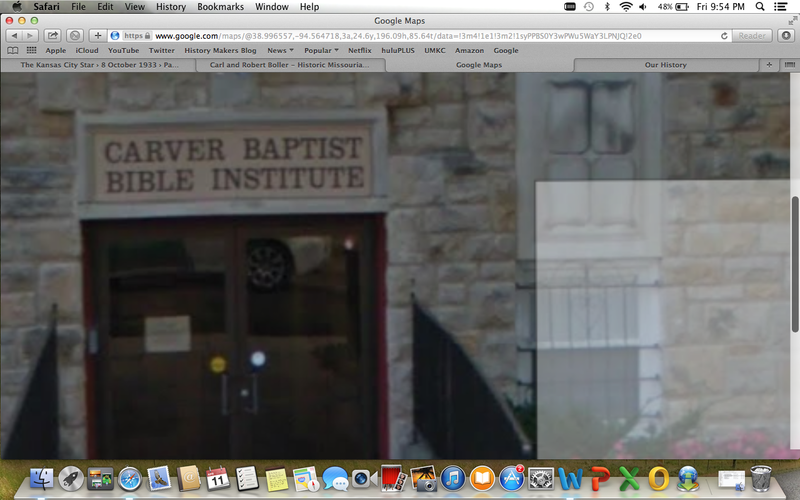 It read “Carver Baptist Bible Institute.” So now I had my answer, or at least an interesting lead. I quickly learned that the Carver Baptist Bible Institute (CBBI) shares this structure with the current congregation, Grace Baptist Church. Anyways, the CBBI has its historical roots in the “Gospel Ambassadors” which was a teacher training ministry for the inner KC area and was founded by a woman named Mrs. Eva Jantz Blevins, a returning missionary from Africa. Once I had made this discovery, however small it may be, I felt truly accomplished. Like I had made a real accomplishment, not just as an intern, but as a researcher. Of course, this information is not unavailable to the public so I cannot say that I made some significant contribution to local KC History, but I nevertheless felt excited that I had made even the smallest discovery. 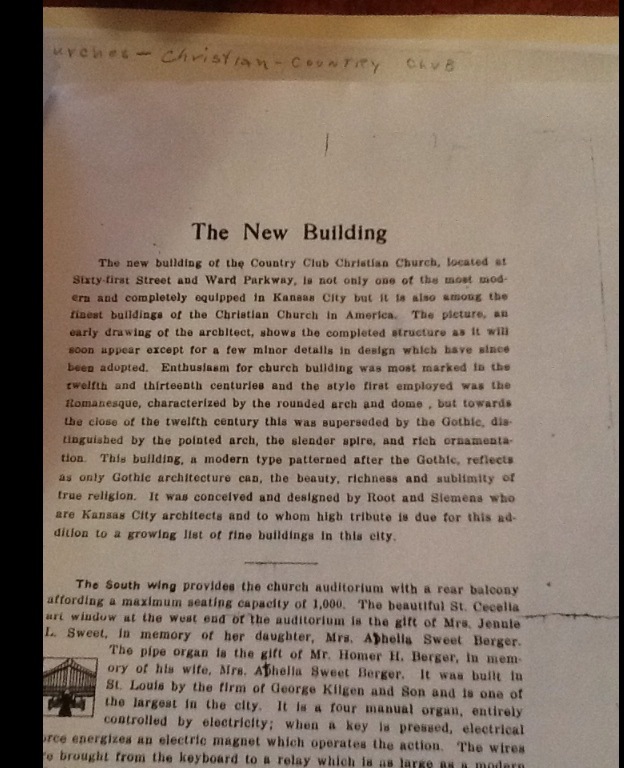 This entry was posted in HistoryMaking and tagged Carver Baptist Bible Institute, Historic Preservation Office, Kansas City Public History, Paseo Christian Church, Puzzle Master on April 21, 2014 by Natalie Walker. Ok… Not really. I am not a real Historian yet, but spending this past Saturday in the Missouri Valley Special Collections sure made me feel that way. It was the first time I have researched there, although I have worked with their website. I was actually kind of nervous to visit the Special Collections because I have never conducted research in that capacity and while I was confident that they had some of the stuff I was looking for, I could not really be sure until I began researching. When I arrived, I found the staff to be quite attentive and helpful. They had me write down a list of things I was looking for with the collection number or finding aid and then retrieved it for me. 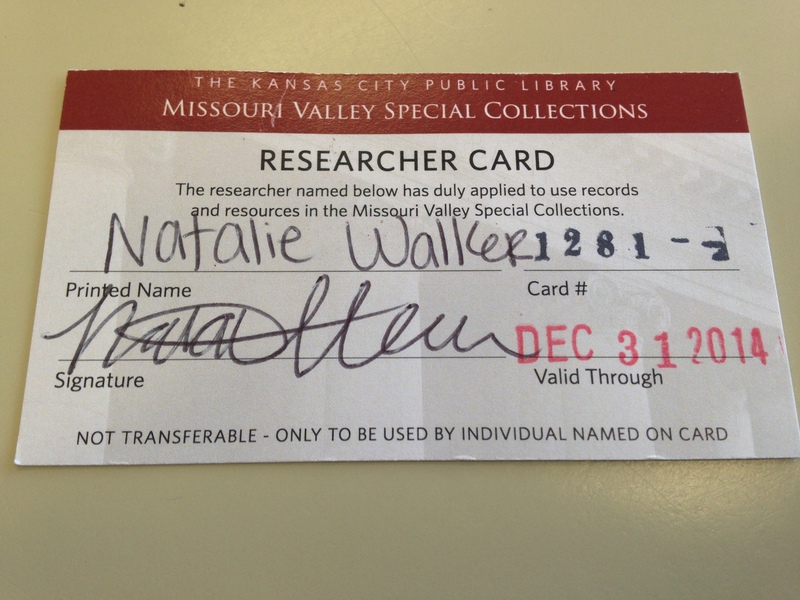 I also get an official ‘Research Card’ which I am probably way too excited about. As they brought me out document after document, I began to feel overwhelmed and hoped that I was finding the right information. Sometimes the documents were filled with all the right information and other times I only found a sentence or two relating to my research. All that to say, I was still impressed with the vast amount of information stored away in their archives in vertical files. 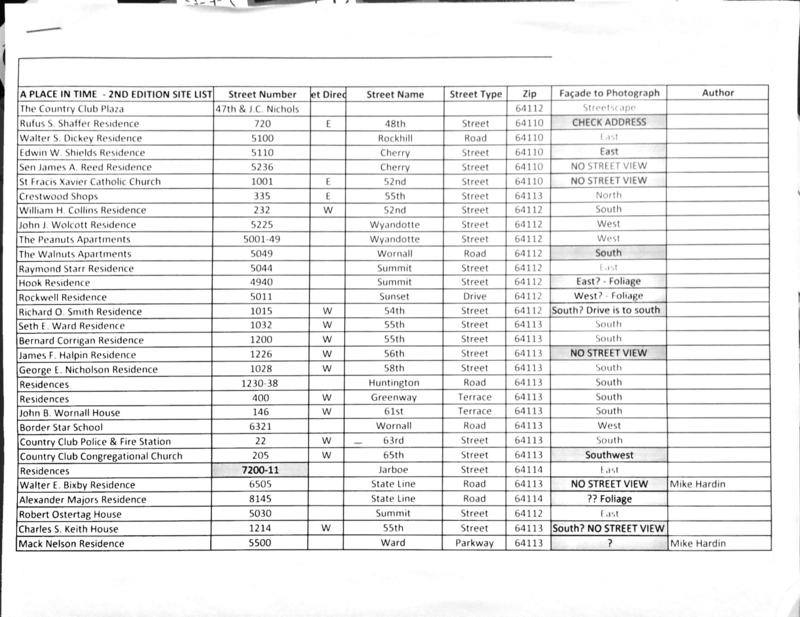 I only found a few items that I needed to research that the MVSC did not have any documentation for. 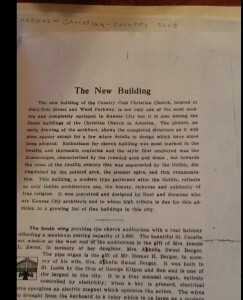 Perhaps my best success was with the church histories that are contained in manilla folders in the vertical files. Not only did these contain detailed architectural histories, but also rich detail about the history of the church from its formation (usually in the late 1800s) to its present congregation and location. 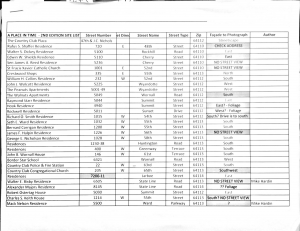 This information was helpful because some of the other churches I have researched, their information located in Religious Property Surveys, are more about architecture and make it difficult to tease out the history of the congregation itself or religious organization. To the left is an example of one of the churches, Country Club Christian Church, and an opening history that the author provided. Overall, I found my experience at the MVSC to be helpful an beneficial. 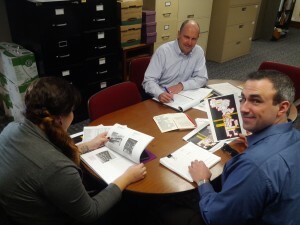 I almost felt like a real Historian as I combed through archival materials. The staff there is great and more than willing to help you research. 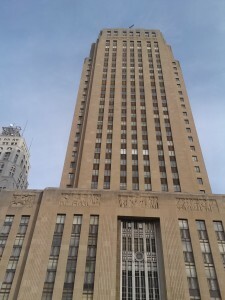 If you are working on a project about Kansas City or Missouri history, this is the place to go! 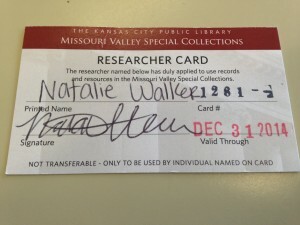 This entry was posted in HistoryMaking and tagged Historic Preservation Office, Kansas City History, Kansas City Public History, Missouri Valley Special Collections on April 9, 2014 by Natalie Walker. 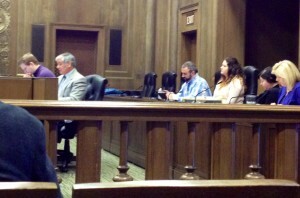 On Friday I had the privilege of attending a Historic Preservation Commission Docket where I was permitted to sit in the committee seating section and listen to the cases being presented. 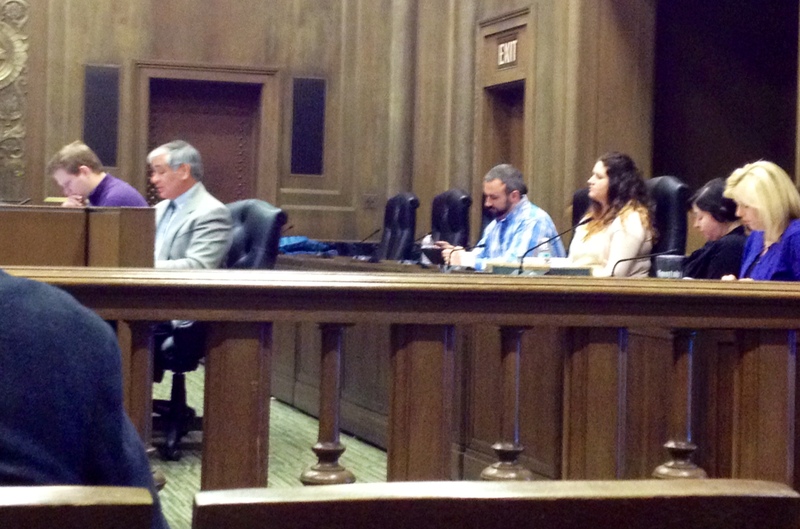 It was a great learning experience and I felt honored to be a part of the Commission’s proceedings and decisions in the various cases they heard. One thing that I found particularly interesting was the process that homeowners must go through when trying to renovate or update a property that is historically significant. Whether it is the period in which the architecture originates or the architects themselves, making changes to a home that fits within one or both of these categories can be a challenge. It was fascinating to witness the relationship between the public and the commission members and how they dealt with each case, trying to come to a fair solution for both involved parties. For example, if homeowners wished to update features like windows, then they would need to ensure that the windows match the originals installed by the architect/builder. Sometimes it is an easy solution that can be quickly reached and other times those making a case for themselves will have to attend multiple meetings and present progress and status reports to the committee. I think it is incredibly important to preserve historic homes, neighborhoods, and architecture that reflects significant styles or architects. The service that the Commission provides allows for the careful preservation of historical significant sites while also permitting homeowners to make desired changes in a way that maintains the integrity of the original structure. Granted, this process is not always simple and can be difficult, but the goal to maintain local history for everyone to appreciate is admirable and should be shared by all. 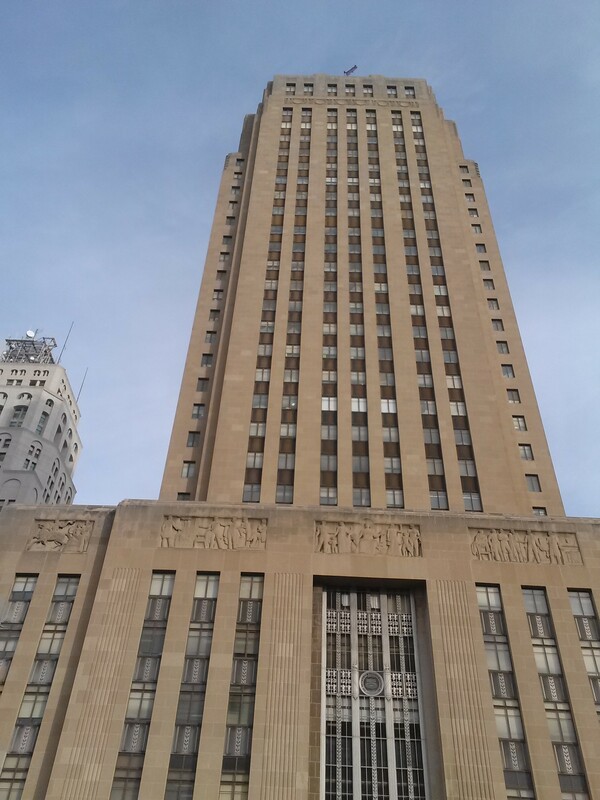 This entry was posted in HistoryMaking and tagged Historic Preservation Commission, Historic Preservation Office, Kansas City Public History on March 31, 2014 by Natalie Walker.